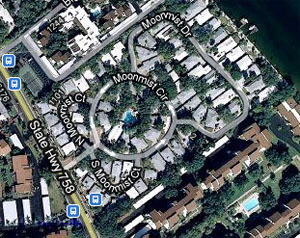 Polynesian Gardens is a Siesta Key resort community of 74 villa residences. This development was constructed in 1968 and is located on the bayside of Siesta Key just north of Stickney Point Bridge and across the street from the beautiful white sands of Siesta Key Beach. The development is governed by a home owners association and is heavily deed restricted. Amenities for the development include a clubhouse, heated pool and fishing pier for the residents. Approximately one third of the villas are in a rental pool and are excellent cash flow properties for owners that frequent Siesta Key on a short term basis. This community is also popular with investors due to the income generating potential of the properties. The waterfront residences can top the $800,000 mark, interior villas can be had for $300,000. Floor plans range in size from 900 square feet to more than 2,600 square feet. Two of the villas have private boat docks. This is a very desirable vacation rental community with on-site management. There is a high turn over of guests during the winter season, if you are looking for a community or residence that is a little less restricted and chaotic you probably would want to steer clear of this style of resort living. Regardless of the turn over, these are solid income producing properties that are will looked after and appeal to buyers looking to cash flow a property that is well managed and renters are supervised. Below are all of the current real estate listings available for sale in Polynesian Gardens as of 6AM this morning.